Farmville is losing traffic – why? If there was one success story of 2009, it certainly wasn’t Gordon Brown, but Farmville and social game-makers Zynga lay a impressive claim to the title. Facebook game Farmville has more members than Twitter and became the biggest (most played) game in the world. Pretty huge. At the highly-publicised launch of the iPhone 4, Steve Jobs paused before the big announcements to talk about “Farming” the iPhone version of Farmville. So I was surprised to read that Zynga the makers of Farmville and portfolio of other succesful games (Mafia Wars) have lost traffic over the past few months. Since Facebook is growing, I just assumed these games attached to it would grow too, but apparently not. 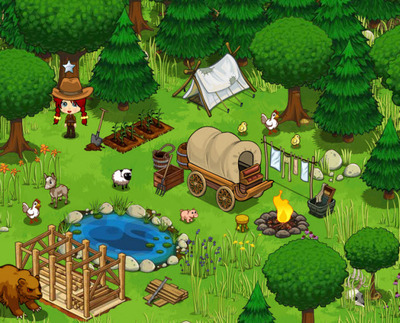 Zynga are making some moves to climb back though through launching the iPhone app and a new game, Frontierville, pictured above. 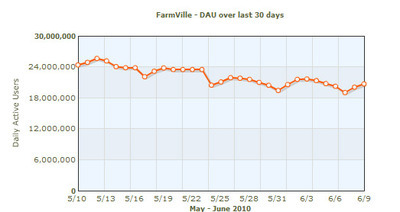 Since I never fully got the appeal of Farmville in the first place, it’s hard to say why the dip has come about. Any thoughts readers? Do you think people have just got fed up with how time-consuming it is? Are people losing friends by posting too many updates about their crops? Is this really true? Oh I totally love to play this game because I get to interact with my friends and relatives while still browsing the usual facebook profile. The way I see it . Farmville drops because there are lots of games better than it. I used to play the game before and I really enjoyed it a lot. yaa most of farmville users is playing farm ville in facebook and facebook have lot’s of apps so farmvile game have compition also thats why farm ville games losing traffic. Well, it becomes too tiring at some point. It was fun until you reached a certain level, then, as Ingrid put it, “a pit of timewasting clicking”. No surprise there. Those players may have moved out to some other interesting games, like Angry Birds or something. I got stressed out playing the game, at one point there were just too many pop-ups and collections and competeitions it got hard to keep track so I stopped. I just got bored, there wasn’t enough interaction or change to the game to keep me playing. I stopped playing Farmville after they began demanding e-mail addresses (you blogged about it on ShinyShiny). They’ve revoked that demand now, but the way in which they went about trying to get personal contact information, well, it was enough to put me off Farmville & other Zynga games for good.